“I would attack climate change because a lot of these people coming north are climate refugees. Not all of them, but a lot of them, and the fact that Donald Trump has waved the white flag of surrender is wrong,” Inslee said on Meet the Press Sunday morning. Inslee, who is running a climate change-centric campaign, echoed claims made by a number of activists, experts and media outlets that man-made global warming is driving drought and crop disease in Central America, particularly Honduras, forcing farmers and laborers to head north. There’s not a lot of science to say human-caused climate change is driving extreme weather and crop problems in Central America right now. Climate models project increased drought in the region, but by the end of the century, not today. Inslee also addressed Trump’s proposal to bring refugees entering the U.S. to sanctuary cities, locales that do not coordinate with federal immigration officials. 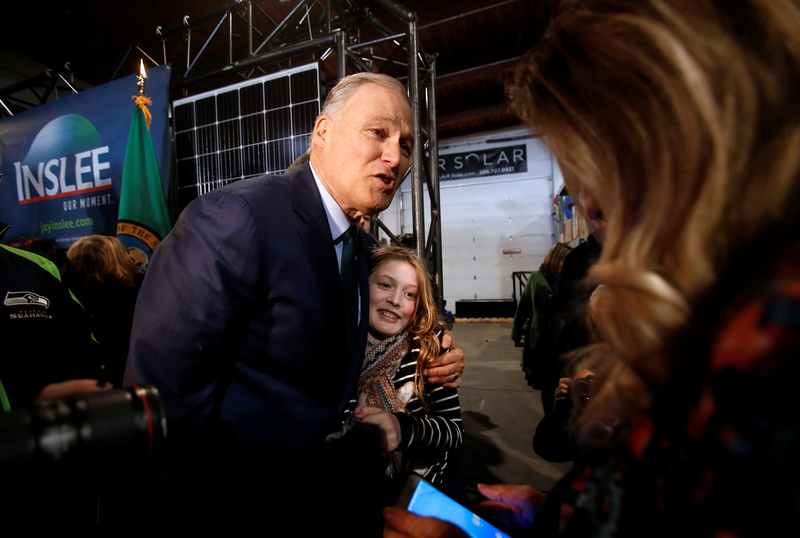 Washington state Governor Jay Inslee hugs Lucia Noreus, 11, of Redmond, Washington during a news conference to announce his decision to seek the Democratic Party’s nomination for president in 2020 at A&R Solar in Seattle, Washington, U.S., March 1, 2019. REUTERS/Lindsey Wasson. “You can’t threaten somebody with something they’re not afraid of. And we are not afraid of diversity in the state of Washington,” Inslee told Todd. “We need more processing facilities to help these folks, and, yes, while they are waiting for these asylum hearings, we are welcoming them to the state of Washington because we have these folks frequently become pillars of our communities,” Inslee said.